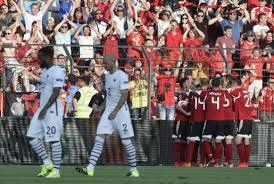 Home › Review › ALBANIA vs FRANCE 1 – 0 Review and Players Ratings. 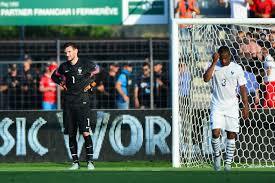 ALBANIA vs FRANCE 1 – 0 Review and Players Ratings. Only six days after a defeat at home 3-4 against Belgium, France did it again ! At first there was some hope for the french side in that small stadium where the Albanian team were undefeated, but that didn’t last. Les Bleus and their Manager Didier Deschamps, had a whole week to ponder about their disastrous performance against the Red Devils and had assured their fans about their willingness to give a good performance for their last game of the season. It was a sunny day but alas not good for playing football; too hot, 35° thus obliging the referee to stop the game twice, so that the players could have a drink . The French got the ball, but they were unable to push forward , for the Albanians were very disciplined and didnt let their opponents approach the danger area; alas it wasn’t the same for the French team. Danger was constant, for France lacked cruelly inspiration, agressiveness and oh well, willingness to give more than the minimum on the pitch. Here’s a stat that made French supporters angry, but also sad; Olivier Giroud (forward) touched less balls than Hugo Lloris(goalkeeper). He was subbed after the first half, but what a waste ! On the contrary, the home team showed that they had the qualities that France lacked and scored a golazzo (44th) on a set piece after a fault of …yes Giroud. Who could guess,( but the home team supporters), that the FIFA 51st rated team could give a lesson of football to the 9th FIFA rated team? Daschamps had already changed several team players who lost the game at the Stade of France( seven of them) but added Paul Pogba and Fékir in the second half. Well, that didn’t change the team’s deficiencies; the french had some rare chances, but were enable to finish them correctly. The young midfielder helped his team to write history, because it was his masterful free-kick who gave the first victory of his country versus France. He was also very present in helping his teammates in recovery and in the game’s animation. Have a nice summer, all of you ! Next round the 4th of September .